The Story of My Teeth is a most unusual book. It’s very clever and very witty – but… I can’t say that I really enjoyed reading it. Which happen to be teeth. 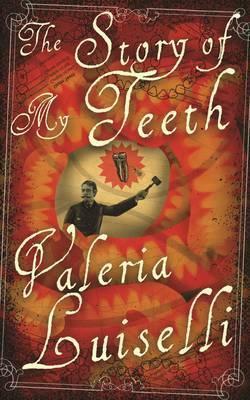 Sanchez himself has bought Marilyn Monroe’s teeth to replace his own, and thus he auctions his teeth with stories about them having belonged to everyone from Plato to Enrique Vila-Matas. Yes, it is meant to be absurd, and yes you are meant to get the connections with the literary borrowings from Proust and Shakespeare et al. I see from GoodReads that it polarises opinion. Review copy courtesy of Allen and Unwin Australia. Thanks for the review. I had this on a list to read (not available here yet) but now I think I’ll pass. It’s sometimes a thin line between being clever and contrived. My father always used to say, “It’s good, but I don’t like it.” That line seems to apply to many novels. I wanted to like it. I’m still not certain that I wouldn’t like it on a different day. After all, I usually like Granta’s books a lot! Yes indeed. And sometimes it’s the only way to deal with something weird or horrible! I just finished reading this book, and like you wasn’t over impressed. It did raise a smile every now and then. And, sometimes when I thought the story was going to improve it went flat again. It’s definitely an odd one, I think. Maybe it’s just a style of writing that takes a bit of getting used to?